Personnel mate Cygnus's Pressurized Cargo Module and Service Module at Kennedy Space Center, in Florida, after loading the spacecraft's initial cargo. CAPE CANAVERAL, Fla. — Orbital ATK's unmanned Cygnus spacecraft is set to embark upon its return-to-flight mission tonight (Dec. 3), carrying more than 7,700 lbs. (3500 kilograms) of research materials, crew supplies and hardware for the International Space Station — and you can watch the liftoff live. The Cygnus is scheduled to launch at 5:55 p.m. EST (2255 GMT) from Cape Canaveral Air Force Station in Florida aboard a United Launch Alliance Atlas V rocket, in the first liftoff for the freighter since Orbital's Antares rocket explodedduring a cargo delivery last October. (Cygus will fly atop an Atlas V until a revamped version of Antares is ready to go.) The launch will initiate the fourth of eight resupply missions Orbital ATK is flying under a $1.9 billion contract with NASA. The live webcast of the OA-4 mission will begin at 4:30 p.m. EST (2130 GMT), and you can watch it here at Space.com, courtesy of NASA TV. On December 2, 2015 the Atlas V Rocket carrying the Orbital ATK-designed and built Cygnus spacecraft was rolled out to the launch pad. "We feel extremely confident, or we wouldn't be sitting on top of that rocket," Frank Culbertson, Space Systems Group president at Orbital ATK, said in a press briefing Wednesday (Dec. 2). "We're dealing with a lot of energy, a lot of power coming off the pad, and a lot of complexity in the vehicles, and that's just a part of the business," Culbertson added. "And we've learned that the hard way over the years many times. But we always come back from that, and we always do whatever's necessary to correct whatever problems occur, whether minor or major." Cygnus' previous launch was the first of three cargo delivery failures over the past year, and will be the first to return to flight. The other two freighters that had problems over the last 12 months — SpaceX's Dragon capsule and Russia's Progress spacecraft — could launch again within 31 days of Cygnus, Kirk Shireman, the International Space Station's program manager, said during the briefing. 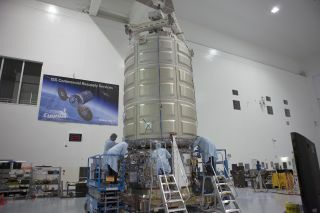 A life science research module, around the size of a locker, will ride aboard Cygnus. Once it reaches the space station, the facility will be able to incubate organisms such as bacteria, yeast, algae, fungi and animal cells for study in space's unique conditions. Another experiment will test the behavior of flame-resistant and flame-retardant textiles in microgravity. And another experiment will study how gases and liquids moving through porous material — research that is relevant to water reclamation, removing carbon dioxide from the air and many other essential space station tasks. Cygnus is also carrying a set of two small cubesats called "Nodes," which will test the capability of a satellite swarm to exchange information and monitor a broad swath of space, in this case measuring high-energy particle fields. The freighter will also tote a satellite built by elementary-school students and a set of mass-produced modular pieces that can be assembled into larger satellites on the fly. In addition, several student experiments will fly aboard Orbital ATK's OA-4 mission, including some that were initially intended for earlier, failed missions. Ken Shields, director of Operations and Education Research at the Center for the Advancement of Science in Space (CASIS), emphasized the value of that learning experience and the students' excitement that the experiments would still get to fly. "OA-4 represents the return-to-flight of our commercial resupply missions," Shields said at a science press briefing Wednesday. "It also signifies and represents the return-to-flight of no less than five STEM [science, technology, engineering and math] experiments that were lost on those launch anomalies."